One way to promote your company's products or services is through blogs or articles, the most effective way is through articles or posts on the blog. That's the easiest and most efficient way because you can insert a lot of information about your products through articles. In addition, articles are the best way to attract Internet users. As an example is information about the tutorial, if you see a video you might have to see it repeatedly because it is in a hurry. Different from articles that are equipped with images make it easier for users to follow. So it's no wonder that many articles get millions of visitors every day. 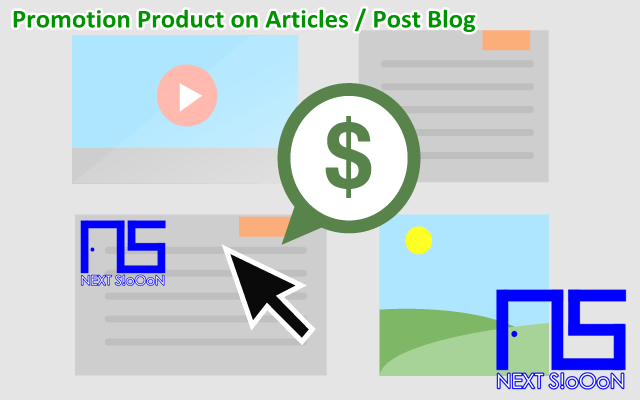 It becomes an opportunity for blog owners to insert ads on articles or posts, behind interesting and useful information, advertisements that are accidentally seen by visitors are inserted. Installation of advertisements through articles can be done at almost no cost, even this method is very effective in increasing sales and adding to Costumer. Before that you have to know a number of things before placing an Ad on Articles or Posts. Next Siooon recommends that you try to create a free Blog provided by Blogger or Wordpress. Then you try to make some interesting articles to bring in visitors, articles about free content websites consist of URLs for your own site. Make interesting posts and updates then don't forget after you finish sharing immediately to social media like Facebook or Twitter. It is intended that articles can be read by people who use Social Media besides that, articles that are shared to Social Media will bring more visitors. As the list of articles published gets bigger, and the more of these appear on various sites, the total number of links for your website also increases. Leading search engines give a lot of meaning to the hyperlinks that enter the site so they can ensure the importance of certain sites. The more incoming connections your site gets, the more significant search engine links to it. This can then increase the position of your site in the search results. More visitors will come from Search Engines such as Google Search Engine or Bing Search. Therefore, make quality articles with the results of your own ideas and writings so that Duplicate Content does not occur. If your website wants to promote a service or product, the link that your article has achieved may mean more potential clients for you. Even if people only search, you can't if they need what you provide later. In addition, individuals who already have certain things they want in their minds but have not been able to decide yet involve various options on the internet. Chances are, they might find one post, curious about the content you wrote, go to your website and become captivated by your own promotion. Search engines not only index sites, they also show printed articles. In addition they index each post written in the topic of your own site. So, once someone searches for the right identical problem, the set of results will have your own website or maybe even show the content you have written. Making their site known is easier if they have articles that increase their traffic and links and make it available to visitors searching the internet. Because many people today take their buying needs online, making your site on search engines through your articles is one way to let them know about you and your business. The good thing about articles is that you can write about things people want to know. This can be achieved in the lightest but professional dispositions, with sales that are not too clear. Try writing a few articles and you will be sure of the surge in website traffic, link popularity, and interest. Before you understand it, you will double and even triple your income. When your blog gets visitors reaching hundreds to thousands and even reaches millions it will be a great opportunity to make Blog as a Promotional Media. You can insert products or services to offer visitors. After that, of course you can find good Promotional Media with almost Free prices, the potential to increase sales will be greater. That is information about Blog Articles as Promotional Media, hopefully useful. Thank you for visiting Next Siooon. The Next-Siooon website that discusses the latest Online Businesses, various accurate and relevant information. We try to provide information that is useful, legit, provides motivation and references so that we can all make money from the Internet. As well as providing information on the Legit Online Business site so that no one is harmed like being deceived. Keyword: Making Articles on Blog or Website as Promotion Media, Making Articles on Blog or Website as Promotion Media Information, Making Articles on Blog or Website as Promotion Media Detail Info, Making Articles on Blog or Website as Promotion Media Information, Making Articles on Blog or Website as Promotion Media Tutorial, Making Articles on Blog or Website as Promotion Media Start Guide, Complete Making Articles on Blog or Website as Promotion Media Guide, Making Articles on Blog or Website as Promotion Media Basic Guide, Basic Information About Making Articles on Blog or Website as Promotion Media, About Making Articles on Blog or Website as Promotion Media, Making Articles on Blog or Website as Promotion Media for Beginners, Making Articles on Blog or Website as Promotion Media's Information for Beginners Basics, Learning Making Articles on Blog or Website as Promotion Media , Finding Out About Making Articles on Blog or Website as Promotion Media, Blogs Discussing Making Articles on Blog or Website as Promotion Media, Website Discussing Making Articles on Blog or Website as Promotion Media, Next Siooon Blog discussing Making Articles on Blog or Website as Promotion Media, Discussing Making Articles on Blog or Website as Promotion Media's Details Complete the Latest Update, Website or Blog that discusses Making Articles on Blog or Website as Promotion Media, Discussing Making Articles on Blog or Website as Promotion Media's Site, Getting Information about Making Articles on Blog or Website as Promotion Media at Next-Siooon, Getting Tutorials and Making Articles on Blog or Website as Promotion Media's guide on the Next-Siooon site, www.next-siooon.com discusses Making Articles on Blog or Website as Promotion Media, how is Making Articles on Blog or Website as Promotion Media, Making Articles on Blog or Website as Promotion Media's way at www.next-siooon.com, what is Making Articles on Blog or Website as Promotion Media, Making Articles on Blog or Website as Promotion Media's understanding, Making Articles on Blog or Website as Promotion Media's explanation Details, discuss Making Articles on Blog or Website as Promotion Media Details only at www .next-siooon.com information that is useful for beginners.